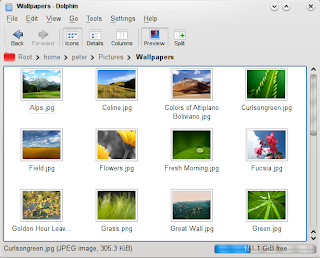 When comparing Dolphin with other file managers like the Vista Explorer or Finder I always was jealous because of the nice frames they provided for picture previews. I initially thought providing frames for pictures in Dolphin can wait until KDE 4.2, as there are more important issues to solve. But as soon I've added this feature to my TODO-list, I could not get this task out of my head... I recognized that obviously all nice pictures of this world seem to have frames: whether you go to an exhibition or take a look on a newspaper - nearly everywhere pictures have frames. By the way: in Dolphin for KDE 4.1 the generating of previews is done more clever (or let's say: less stupid) than in the 4.0 version. Now the previews are generated for all visible items first like in KDE 3, not "randomly" like in KDE 4.0. This improves the felt performance a lot, as from the users point of view the previews are generated now immediately. Please note that when you try SVN trunk that previews in general take a lot time in the debug version. Still there seems to be room for improvements when the previews are in the cache. KDE 3 is still faster in this regard, but we are working on it; I hope we can provide a faster solution for KDE 4.1. One goal of KDE 4 was that Konqueror stays as the army swiss knife for power users (Dolphin never was intended to replace Konqueror). 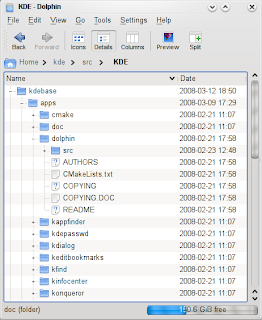 Konqueror uses the Dolphin KPart for the file management and this implies that the Dolphin KPart must provide the same features as Konqueror in the KDE 3 series to keep our promise. 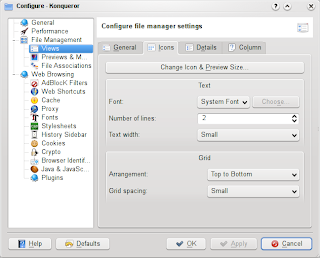 It is turned off per default in Dolphin, but I think it is no problem for Konqueror users to turn it on :-) There are still some minor issues when reloading views (e. g. the folders get collapsed again), but they will be fixed until the KDE 4.1 release. Until now I was very reluctant for maintaining an own blog. I'm not good in writing thrilling stories and answering questions in the comments section is not always a straight forward task. But during the development of Dolphin-features for KDE 4.1 I faced the situation that I don't get enough feedback. There are not that many people who work regularly on SVN trunk, so I thought that I use this blog to present some new features in Dolphin. Any feedback is welcome!